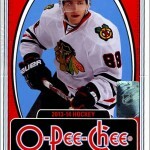 For the fourth year in a row, Upper Deck has leased the name “O-Pee-Chee” from Topps in order to brand a set of hockey cards. Overtly emblazoning the O-Pee-Chee logo and featuring Wayne Gretzky on the box and wrapper, the set is clearly meant to appeal to old school collectors who cut their card-collecting teeth during the 1970s and 1980s. And for the most part, it will. 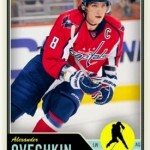 Comprising the set are 500 base cards, 50 short-printed Marquee Rookies and 50 short-printed Legends. 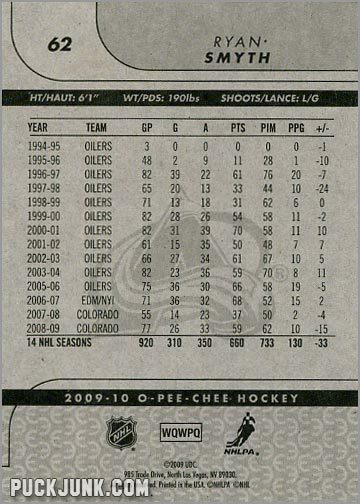 The amount of players offered in each year’s OPC set is always its strongest point. 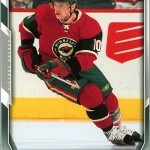 The base set has 500 cards – 495 cards of veteran players and 5 checklists. That averages to 16 or 17 cards per team. Those who like cards of not only superstars, but of regulars too, will enjoy putting together this mega-set. 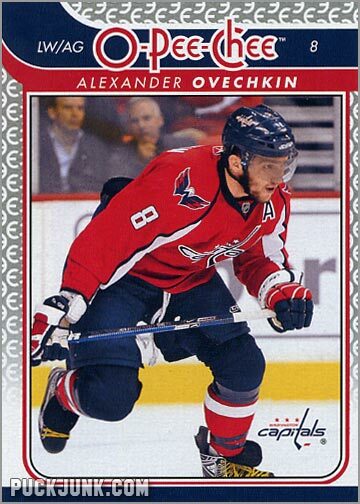 Except for the giant, overbearing O-Pee-Chee logo at the top, the design of this year’s set is appealing. 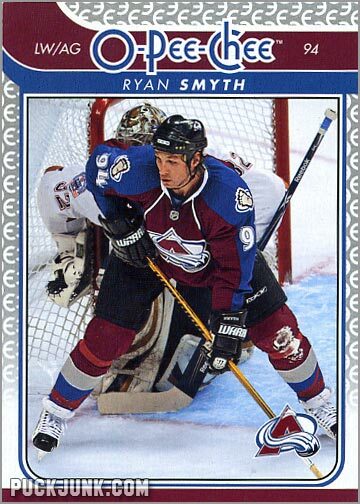 Team colors at the top and bottom adorn the borders, while two hockey stick-shaped “swoops” give the top of the card a little visual flair. 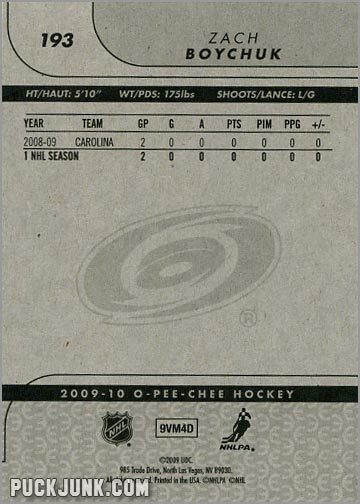 The “E” from the O-Pee-Chee logo is used as a pattern on the top and sides of the card. The team logo is superimposed over the player’s photographs. The photos themselves are nothing special – game action shots that lack both excitement and variety. 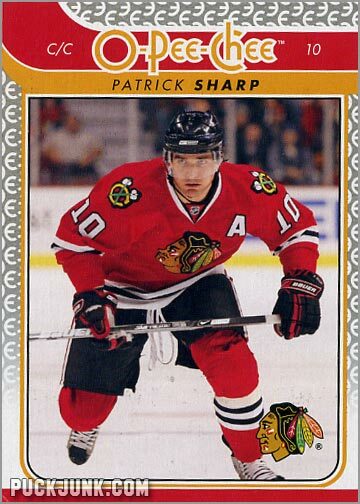 Had the unnecessarily large OPC logo at the top been shrunk down and placed elsewhere, this might have been one of the best-looking sets from the post-lockout era. Still, the design is slick and colorful while retaining a bit of a retro feel. Normally, cards of players who change teams over the summer ruin such a design. But not this year. 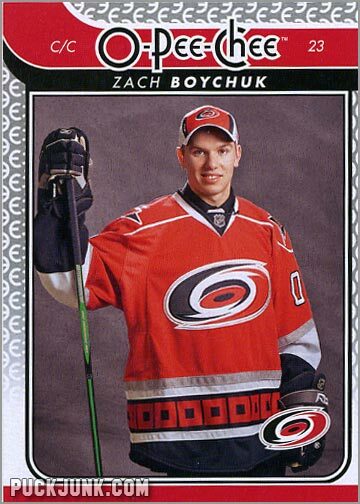 Instead of showing a player in their old uniform, but using their new team’s logo and colors for the borders – resulting in an ugly mishmash of colors – Upper Deck chose to “not go there.” In this set, players are shown with whatever team they finished last season with. 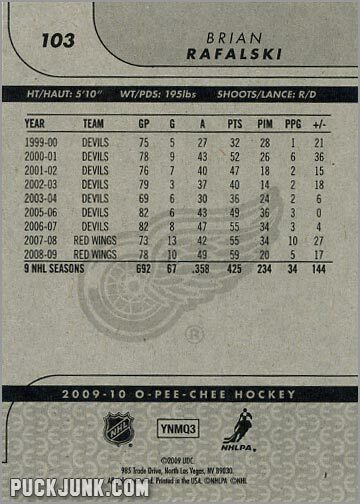 For example, Marian Hossa’s card sports a Red Wings logo, and not a Blackhawks logo. 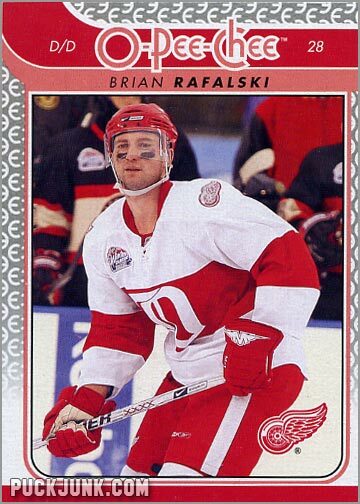 This makes sense, since the photo shows him as a member of the Wings. 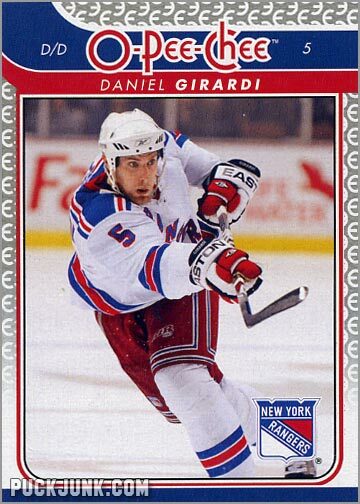 I always felt that a card company should not update the logo unless they have an updated player photo as well. 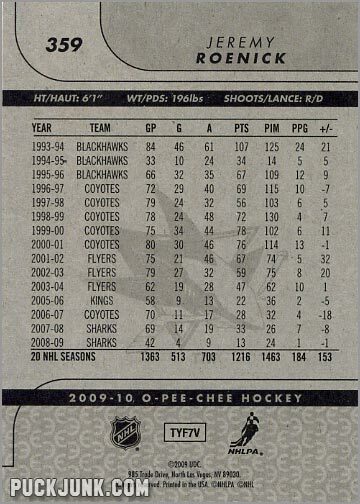 The back of each card can accommodate up to 15 years of stats, and also has height, weight and if they are a left or right-handed shot (or catch for goalies). But hockey is an international game more than ever, with talent coming from all over the globe. Thus, the pronunciation of each player’s name would have been a helpful inclusion. 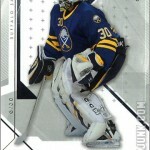 The biggest drawback, though, is the cheap-looking gray backs of each card. Compare OPC at $1.59 for a 6-card pack to Victory, which is $1.00 for a 6-card pack. Victory cards are printed on superior, glossy stock and have full-color backs. 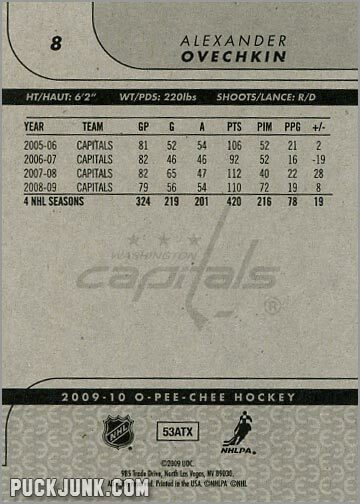 OPC cards look like they were printed on cardboard from a shoebox. Perhaps this is meant to make OPC cards feel a bit more retro – but then shouldn’t they cost less than Victory? One in every two packs contained a subset insert card – either a Marquee Rookies (numbered 501-550) or a Legend (551-600). 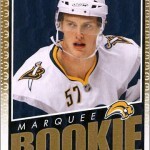 Fifty “holdovers” from last season make up the short-printed Marquee Rookies subset. 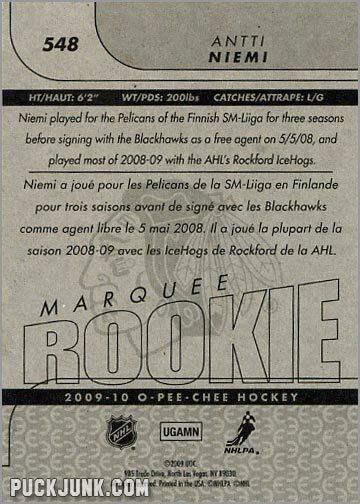 Meaning, no hot new rookies from this summer’s draft, but guys who made their NHL debut late last season. An update set released later this season will include newer rookies like Victor Hedman and Jonathan Tavares. 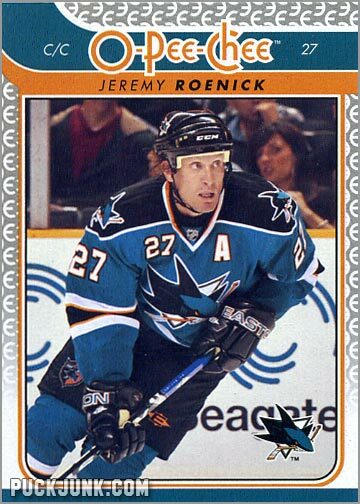 The Marquee Rookies have a simpler design than the base cards, utilizing a head-and-shoulder portrait shot superimposed over a solid colored background. 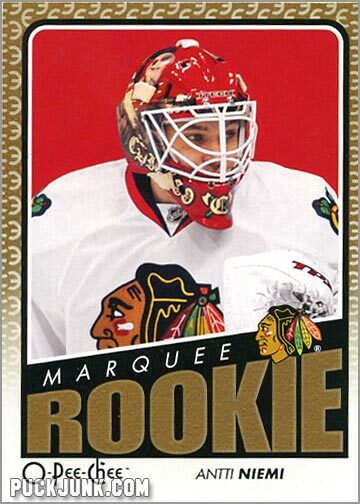 The word ROOKIE – which takes up about 20% of the card – and the borders are printed in gold ink. 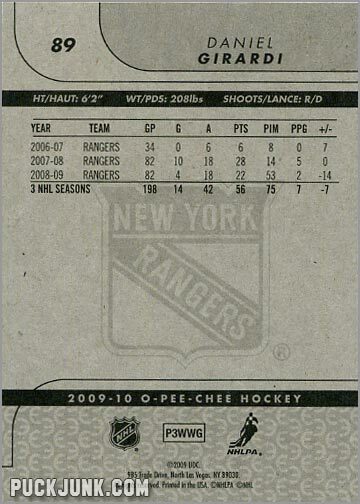 Because “O-Pee-Chee” means “nostalgia” to many, the last 50 cards are of retired greats. 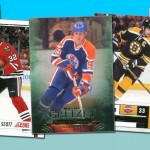 Most are in the Hall of Fame, like Wayne Gretzky, Mike Bossy and Bobby Orr. But a few non-HOFers snuck in too, like Terry O’Reilly and Guy Carboneau. 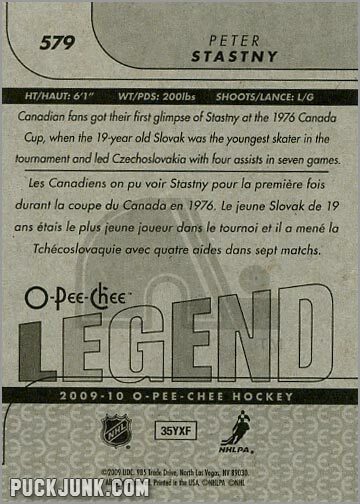 The ever-popular Don Cherry also appears in the Legends subset. Like the Marquee Rookies, the Legend insert cards use gold ink for the borders and the word LEGEND, which looms at the top. It is always a treat to see old time hockey players included in today’s sets. In a way, these two subsets are reminiscent of In The Game’s annual “Heroes and Prospects” set, which features retired greats and up-and-comers. 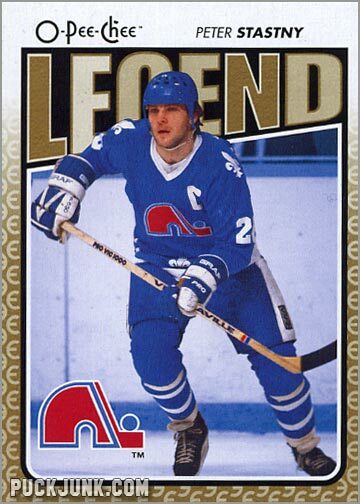 Given Upper Deck’s past history of copying other companies designs (see “Upper Deck Vintage”) and ideas (last season’s “Montreal Canadiens Centennial” set versus ITG’s “Blue, Blanc en Rouge” set), this is probably more than just a coincidence. 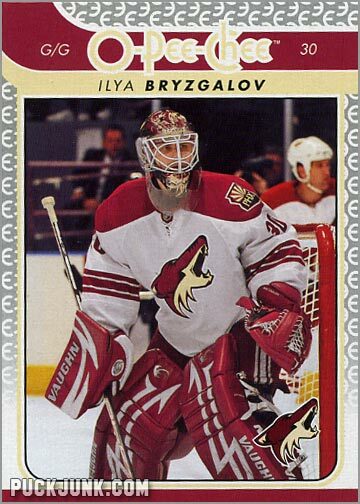 At the time of the set’s release, a single pack of 2009-10 sold for $1.59 and contained 6 cards. Rack packs had 32 cards and cost $4.99. Blaster boxes had 14 packs and sold for $20, while a wax box had 36 packs and sold in the $60-$70 range. Though not perfect, the set has a decent design and great selection of veteran players. The Marquee Rookies are mostly a forgettable lot, but that may change as some of them break into the NHL. Upper Deck will expand on this with an update set later this season, which will result in what will be the most comprehensive hockey set of the year. Had the production values been higher, this set would have been untouchable.